This article is about the plot element. You may be looking for other uses. "All worlds begin in darkness, and all so end. The heart is no different. Darkness sprouts within it, it grows, consumes it. Such is its nature. In the end, every Heart returns to the darkness whence it came! You see, darkness is the heart's true essence..."
Terra taps into his inner darkness. Darkness is a force parallel to light, and is also used in the form of attacks in the Kingdom Hearts universe. Darkness has been known to cause the loss of people's hearts if they have delved too deep into it. Slowly suppressed and conquered by darkness's influence, these unfortunate souls become Heartless and, if their heart is strong enough, leave behind a body that becomes a Nobody. Those who follow the path of darkness will usually gain untold power at the expense of something of their former selves. The Realm of Darkness is also one of the three known realms in the Kingdom Hearts universe, along with the Realm Between, and the Realm of Light. Though darkness is mostly used by the series's villains and is believed to be pure evil, it is not entirely malevolent; friendly characters are able to use the powers of darkness to some effect, ranging from opening the Corridors of Darkness to projecting dark energy blasts (one of Riku's abilities in Kingdom Hearts II). Additionally, Mickey Mouse, a heroic character, uses the Kingdom Key D, which originates in the Realm of Darkness, and Spirit Dream Eaters support Sora and Riku despite them being manifestations of darkness. Nonetheless, different characters have different views on darkness: Aqua regards it as nothing but "hate and rage," while Mickey insists that light and darkness are interdependent and cannot exist without one another. Nearly all beings have darkness in their hearts, but the levels of darkness and light vary from person to person. For instance, Sora has less darkness in his heart than Pete or Maleficent. There are a few exceptions to this rule, however, as all seven of the Princesses of Heart naturally have hearts completely devoid of darkness. As a result of Master Xehanort forcibly removing the darkness from his heart, Ventus's heart is pure light as well. When Nobodies or Replicas are defeated, their body and soul, if any, fade back into the darkness to await being reunited with their missing heart. The χ-blade, which acted as the counterpart and key to Kingdom Hearts, was forged from pure light and darkness. The violence of the Keyblade War shattered it into seven pieces of light, and thirteen pieces of darkness. According to Master Xehanort, the Keyblades are the remains of the Keyblade wielders after the Keyblade War between the battle of light and darkness. Vanitas was a living embodiment of the darkness that once resided in Ventus's heart, having the ability to turn negative emotions into Unversed. Master Xehanort plotted to have Terra submit to darkness in order to prep him for hosting his heart, succeeding in doing so and possessing him. Most of Sora and company's quest is aimed at closing the Door to Darkness and eliminating the Heartless epidemic. The entire story seems at first very biased towards the force of Light. However, one important belief about light is that there is always "a light in the deepest darkness". This plays a role many times in the story, including when Sora opens the Door to Darkness and finds a blinding light inside with King Mickey. Even through all of the bias towards light, the opposed forces are in fact still balanced with a closed Door to Light and a closed Door to Darkness. There are also two Keyblades, one from the Realm of Light, which is used by Sora, and one from the Realm of Darkness, which is used by King Mickey. The most major story development about light and darkness in the story is Riku's constant struggle throughout the game against the darkness in his heart. He tries to shun the darkness and "Ansem" out of him, but he cannot do it. Because of this, "Ansem" taunts him that darkness is his destiny. Riku finally finds a revelation in himself when he talks with Naminé after Zexion, in the guise of Sora, blinds him with light. Riku finds that darkness is not bad, and he should use it along with light to help defeat his enemies, and give him more power. This changes Riku, and "Ansem", thinking that Riku has turned to the darkness, mockingly tells him that he was right about Riku's destiny. Riku fights "Ansem" and destroys him. However, "Ansem" still lingers in Riku's heart. Riku later declines Naminé's offer to seal "Ansem" away in Riku's heart. Then, at the end of the story, DiZ asks Riku which path he wishes to take. He decides to take the road to dawn, a path leading from darkness to light. The Organization use the Corridor of Darkness to travel different worlds to conduct their missions. While Roxas is in his coma, the members at Castle Oblivion faded back into darkness. 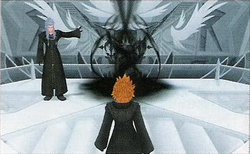 At the climax of the game, Riku uses the darkness in his heart to transform into Ansem, Seeker of Darkness. Kingdom Hearts II presented darkness as a power for not only the villains, but the heroes as well. Many of the protagonists of the series, such as Riku and Sora, use darkness during the game. Riku, in the form of Ansem, has control over numerous powers of darkness. He is able to cast Dark Firaga, open Corridors of Darkness, and use darkness in finishing moves for his combos. After Riku returns to normal, he can no longer use the Corridors of Darkness, but is able to use Dark Firaga and Dark Shield, among other attacks. When Sora enters his AntiForm, he turns into a shadowy silhouette of himself and attacks enemies with darkness. Organization XIII uses the power of darkness either to help them fight or use the Corridors of Darkness. After Xemnas absorbs the remnants of Kingdom Hearts, he uses the powers of both light and darkness. Maleficent, once again an antagonist, uses darkness as well. She uses it to cover Disney Castle's Hall of the Cornerstone with thorns. She is also able to use darkness to create walls of green fire. When Sora and his friends confront Xemnas, he asks the warriors why they hate darkness. King Mickey replies that they do not really hate it, and are just scared of it. He goes on to say that the world has both light and darkness, and darkness is half of everything. He then says that it makes him wonder why they are scared of the dark. Riku answers that "it's because of what's lurking inside it", referring Xemnas and the other villains. The Realm of Sleep cannot be entered by the Heartless. Though darkness is still present in these Sleeping Worlds, in the form of the Dream Eaters, there are the malevolent Nightmares, which devour happy dreams, and the benevolent Spirits, which destroy the Nightmares to ensure good dreams. Though fewer in number than their evil counterparts, the Spirits become allies to Sora and Riku in their Mark of Mastery exam; they will perish if not helped when critically injured. By the end of the story, Sora has created a small army of them. Villains who are figments of the Sleeping Worlds' dreams are able to call upon Nightmares. Claude Frollo was able to create and command the Wargoyle, while CLU is able to call upon the Commantis. Saïx opens a Corridor of Darkness so that Roxas can perform a mission. While darkness is often associated with evil, it can be used for the force of good. If one can accept darkness into themselves without allowing the darkness to consume them, they may wield its powers without succumbing to its influences (as in Riku's situation). King Mickey's Keyblade, Kingdom Key D, is a Keyblade from the Realm of Darkness, though this does not mean that it is actually affiliated with darkness; in this case, it means that it is necessary to close world doors from inside the Realm of Darkness. Darkness is also seen being manipulated into attacks by the Heartless and Nobodies, and to a greater degree Maleficent, the members of Organization XIII, and Riku. Sora can also slightly manipulate darkness in Kingdom Hearts II through his Drive Form, AntiForm, in which he reawakens the darkness that was created when he became a Heartless. Darkness is also been shown to be able to revive others, shown when Maleficent used the powers of darkness to resurrect Oogie Boogie, and Ursula's journal entry states the powers of darkness brought her back. Darkness can also be used for transportation. Experienced users of darkness are able to open a Corridor of Darkness to travel between locations with a great degree of speed. However, these are physical corridors of darkness, and prolonged or repetitive use of this means of travel will often allow darkness to manifest deeper within a being, leaving them more vulnerable to its negative effects in the long run. There are many items that have used for protection against darkness. Some of these items are seen as simple things, such as the Midnight Anklet and Champion Belt, which boost the equipped character's resistance to dark-element attacks, or the Keyblade Armor and black coat, which protect the wearer from the darkness between the worlds. Terra submits to his darkness. Darkness creates and feeds off of primal emotions such as revenge, hate, greed, and fear. In the process, it makes those it affects experience and exhibit these feelings while constantly making those feelings stronger, eventually leading to the affected becoming a Heartless and (rarely) a Nobody. If one relies too heavily on the powers darkness gives them, it will swallow their hearts in a matter of time as Riku almost lost his heart from using Corridors of Darkness frequently. Darkness can also change the physical appearance of those it affects, the most extreme is a normal person becoming a Shadow and Riku taking on the form of Ansem, Seeker of Darkness. The most common physical changes are golden eyes, darkened skin, and silver hair; however, the manifestation of these traits depends on how much the darkness has stained the heart. Master Xehanort and his various incarnations display all these traits as he willingly embraces the darkness. Ansem the Wise, on the other hand, only had golden eyes, as he did desire the power of darkness the way Xehanort did and only used it to traverse the worlds. ↑ Kingdom Hearts 3D: Dream Drop Distance, Yen Sid: "As for the real χ-blade, it did not survive the battle. The two elements that created it, one of darkness and one of light, shattered into twenty pieces—seven of light; thirteen of darkness." ↑ Kingdom Hearts Birth by Sleep, Master Xehanort: "Behold. These lifeless keys used to be full of power—united with the hearts of their masters. On this barren soil, Keyblades of light and darkness were locked in combat... as a great Keyblade War raged. Countless Keyblade wielders gave up their lives, all in search of one, ultimate key. And it will soon belong to me... χ-blade." This page was last edited on 22 March 2019, at 21:00.